When it comes to leadership, learning on the job will take you only so far. To make a real difference to your company’s success, you need proven strategies and tactics for leading in a constantly changing, highly complex business environment. 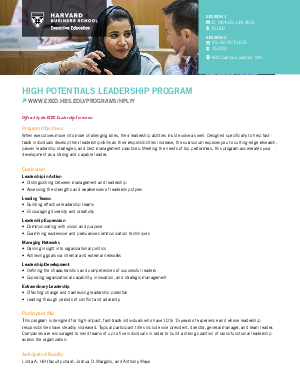 Step up to a new level of leadership performance with the High Potentials Leadership Program from Harvard Business School Executive Education. Designed for top performers with 10 to 15 years of experience, the program delivers leadership skills and insight essential to delivering on a growing set of responsibilities. You and a talented group of peers will learn how to build strong and productive teams, motivate others, manage performance—and develop the leadership approach that’s right for you. You’ll return prepared to face leadership challenges with new confidence. Download program details and application information to learn how HBS Executive Education can benefit you and your company.